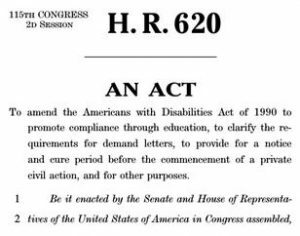 Last month, the House of Representatives passed a bill that will make it harder for Americans living with disabilities to sue public establishments for violations of the Americans with Disabilities Act (ADA). Under the ADA Education and Reform Act, people with disabilities will be required to wait at least six months to file a lawsuit against a business that fails to comply with the ADA. Advocates fear that this bill will weaken the ADA. “We are extremely disappointed and downright angry to see this blatant attack on the civil rights of people with disabilities to access places of public accommodation,” the American Association of People With Disabilities said in a statement after the vote. The of fate bill, which passed by a vote of 255-192, has yet to be determined by the Senate. For more information, visit AARP.